Simple to operate and easy to maintain, the microCMA provides a complete quantitative surface sensitive elemental Auger Electron Spectroscopy (AES) analyzer package that mounts on a 2.75”/ 70 mm CF flange. The USB interface and Windows acquisition and data massage software make it as simple to acquire AES data as it is to operate an RGA. The microCMA is Plug and Play Auger Spectroscopy made simple. 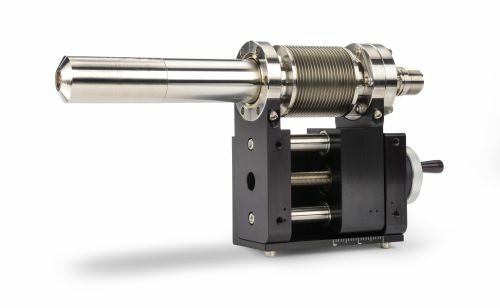 The microCMA is a non-scanning (imaging) cylindrical mirror analyzer designed for the many applications for AES that do not require scanning (imaging) capability. Compact: Fits on a 2.75" / 70 mm CF flange (min. 1.52" / 38.6 mm I.D. tube). It is now possible to build an AES system with just a T and a small ion pump! Proven Design: The second order focusing of the Cylindrical Mirror Analyzer provides both good transmission and resolution. Easy to Use: With a USB interface and open architecture, the control and data- massage software interface is as simple to use as an RGA – point and click. Powerful: Auger Electron Spectroscopy (AES) is a powerful surface sensitive technique that provides you with quantitative information on the first few monolayers of your sample. Auger Electron Spectroscopy is an analytical technique that uses a primary electron beam to probe the surface of a solid sample. Secondary electrons are emitted as a result of the Auger effect and the kinetic energy of those electrons is element specific. By differentiating the peak energy from the background energy, quantitative analysis is possible. AES is a surface sensitive technique due to the short mean free path of the electrons, just a few nanometers. All light elements except H and He are detected. The cylindrical mirror analyzer is a variation of the parallel-plate analyzer design and is today the most popular type for AES due to the design's high sensitivity and throughput.